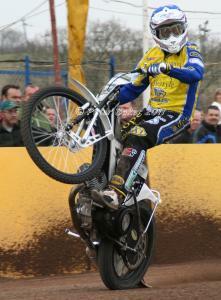 Cameron rides for local speedway team ‘Eastbourne Eagles’ and will captain the side this season. Eastbourne ride in the ‘Sky Sports Elite League’ which is the top tier of the British Speedway Leagues. Cameron will also be competing in the World Longtrack championship in which he came 6th in his first attempt last year. He is a true contender to become World Champion in 2013.